Ohio cities need three important utilities to stay viable: gas, electricity, and water. Now a fourth utility is pushing its way into the conversation: internet access. More specifically high-speed internet access. Where once communities have had to hope that private companies would provide that service, more and more local governments are taking on the responsibility themselves. 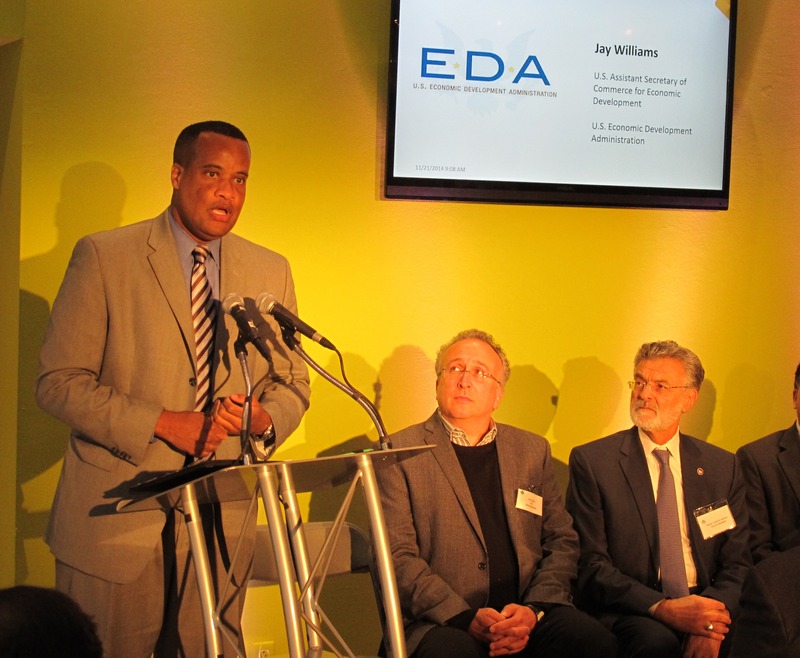 In late 2014 Assistant Commerce Secretary Jay Williams came to Cleveland to announce a federal investment for a 100 gigabit trunk line that runs down right through the heart of the city. The important distinction there is “commercially available.” There have been 100 gigabit fiber lines connecting New York to Chicago but for the first time businesses could tap into them. It’s been a slow process but businesses have joined Case Western Reserve University and local medical institutions to tap that high speed connection. Other cities in Ohio are building out their own systems with industry in mind. Will Ersing with the City of Hudson says if you’re trying to attract businesses, high speed fiber is key. “Back in the day, one key factor was a rail spur. The rail spur has been replaced with a fiber strand,” he said. Ersing’s title with the city is Chief Broadband Officer. Hudson started its own broadband company, Velocity, and began calling itself Ohio’s first “Gigabit City.” It has laid or strung 60 miles of glass fiber, connecting all the business districts, 50 percent underground and 50 percent on poles. It’s a big help that Hudson owns its own electric company, Hudson Public Power, so the city owns the poles. Ersing says companies had threatened to leave the town of 22,000 if they couldn’t get faster internet. “Companies from bio-med, architecture, software design. A lot of these companies are transitioning from in-house servers to cloud-based applications. So they need that bandwidth,” Ersing explained. City officials asked local companies Windstream and Spectrum cable to offer the higher speeds that businesses were asking for. They were turned down. Now, Hudson Velocity offers 5 levels of speed, up to 10 gigabits per second. The lowest, 100 megabits cost $100 a month. Those are all “symmetrical” speeds, meaning uploads are the same speed as downloads. Roth says he needed it to attract companies from around the world to his small town of 7400 people. He had low-cost land, water, and a workforce. So Fairlawn built its own internet provider, Fairlawn Gig. It partnered with Fujitsu to bury 55 miles of fiber optic cable. That was an engineering company. Like Hudson, Fairlawn is also seeing medical and accounting firms who need the bandwidth moving in. Unlike Hudson, Fairlawn is also providing fiber to every household in the city. The operation is run out of the city’s own data center which hums with cooling fans in a room of the city’s Public Service Department building. Fairlawn can offer speeds up to 1 gigabit (1000 megabits) per second for $75/month but, for homeowners, it more commonly sells a 150 megabit speed for $55 dollars a month. That is still at least 5 times faster than most commercial broadband. Like Hudson, the upload and download speeds are the same. Mayor Roth says the availability of that fiber optic cable to every house has increased home values (up 8 percent in 2017) and home sales in his city. Is it an enticement to even average residents to move to Fairlawn? Fairlawn officials planned for about 35 percent of the city to sign up for the service but they’ve gotten 50 percent so far. They also are building out a city-wireless system using a tower on city property. While Fairlawn and Hudson are talking about 50 or 60 miles of fiber, Medina County Fiber Network is trying three times that. Medina County, like other communities, raised money to build its system through the local port authority and by selling bonds. In Stark County, a group called the Stark County Broadband Task Team wants to build something similar. Its website is called the Forth Utility. But one of the team’s three co-chairs, is getting cold feet. County Commissioner Richard Regula says Stark County, with one of the lowest sales taxes in the state, cannot afford to subsidize it. “I get the need. The reality is: how are you going to fund it?” Regula asked. “Unless you’re going to subsidize it, which I think they’re doing in Medina. I don’t know how Hudson and Medina are paying back their costs in building out a center. Regula, who owns a trucking company, says his goal in life is to complete the the expansion of US Route 30 to a 4 lane expressway. It runs from Chicago to Pittsburgh but the bottleneck is in Canton where it squeezes to 2 lanes. “If you want to really build the economy there’s no better way to do it than road constriction in my opinion,” said the Commissioner. Regula adds local cable companies are improving their offerings due to the mere threat of municipal broadband. The cable provider in Massillon, MCTV, is now offering speeds at 100 megabits. And the evening we spoke with Regula, Spectrum ran advertisements on local TV touting their new 100 megabit speed. Back in Cleveland, the city with the super speed 100 gigabit line, a lot of people still have no internet access at home at any speed. A study by the Federal Reserve Bank of Dallas found Cleveland ranked third worst in the nation for internet access. 36 percent of its population lacks any internet connection. The non-profit group Digital C is focusing on providing those connections. CEO Dorothy Baunach says just filling out a job application or student loan form requires an internet connection. Digital C has started connecting public housing buildings and is looking to expand rudimentary networks of routers in poor neighborhoods. Baunach echoes Mayor Roth and others in calling internet access a necessity. As wealthier cities, like Fairlawn and Hudson, build their own systems, opposition is also building. In some states, the big commercial internet providers have lobbied state governments to restrict municipal-owned internet services or even ban them altogether. But in Ohio, state legislators are looking to help. Senator Joe Schiavoni proposed Senate Bill 199 to create the Ohio Broadband Development Grant Program and provide some $50 million dollars a year to build high speed (25 megabits/second or faster) internet connections to rural areas. Schiavoni is running for governor. His fellow Democratic contender Dennis Kucinich is promising a new public utility in Ohio to provide broadband services. It’s a bipartisan issue. Republican State Representative Cliff Hite is sponsoring a house version of Schiavoni’s bill. And the house has already passed a bill by Republican Rick Carfagna that calls for local governments to pay 66 percent and the state to pay 33 percent toward the costs of building last-mile internet connections to areas where private companies refuse to go. In the meantime, it’s been the cities and counties who have led the way.